What is the Site of Reversible Destiny –YORO PARK? The Site of Reversible Destiny –Yoro Park is one of the art/architectural works of the internationally acclaimed artists/architects Shusaku Arakawa + Madeline Gins. Based on their long-term research, Arakawa + Gins came up with the conclusion that we should transform the present world into a hopeful future, using the unlimited possibilities of our bodies. Arakawa + Gins stated that changes in bodily perception would lead to changes in consciousness; and so they became determined to explore architecture and construct environments that can challenge the body as a way to overcome death, and to reverse our destinies. In the Site of Reversible Destiny –Yoro Park, horizontal and vertical lines are eliminated as much as possible, and a number of artificial horizons are scattered throughout to disturb our innate sense of balance and perspective. We are invited to walk like toddlers in the site, which is structured to rebuild our perceptions as we first started to know the world. The Site of Reversible Destiny –Yoro Park should be seen as only a starting point, as Arakawa + Gins always said, a project that is to be continued. Because the Site of Reversible Destiny-YORO PARK has many steep slopes, we advise that you wear rubber - heeldshoes. 9:00 am to 5:00 pm (Entrance until 4:30 pm)　*May be closed due to weather conditions. ※Group discount for parties of 20 or more. ※Elementary, junior and senior high students must be accompanied by an adult. The Site of Reversible Destiny –YORO PARK is an experimental art project created by artists/architects Shusaku Arakawa and Madeline Gins. Due to the many steep slopes of the site’s huge bowl-shaped terrain, below you will find information regarding our services to make your visit safe and more enjoyable. Please watch your step, especially when you are with small children. Charge-free helmets and sneakers are available for rent. Please feel free to ask our museum shop. Some areas are not accessible by baby carriages and wheelchairs. Please follow our staff’s directions if you need to use either of them. 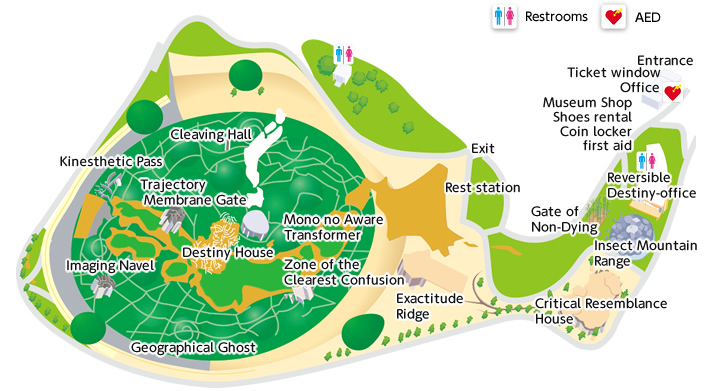 Restrooms are located in the “Reversible Destiny Office – Yoro”. If you accidentally get hurt, contact our staff for immediate help. The Site of Reversible Destiny –Yoro Park invites visitors to encounter unexpected wonders that may happen every second through their bodies, and to discover incredible possibilities within themselves.